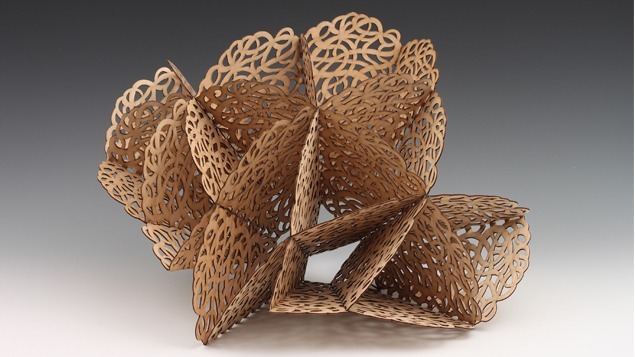 Linda Fleming’s intricately cut maquettes suggest the co-existence of the mundane, the cosmological, and the scientific. At once delicate, but structurally sound, the structures represent diagrams of thought in which physical sensation and perception are mingled. Fleming maintains studios in the San Francisco Bay area, Nevada, and Colorado, and was a founder of the 1960s Colorado artist community Libre, which embraced the idea of creating a utopian setting for art-making. Fleming’s architectonic structures, made from paper, wood, and steel, share an affinity with the work of Buckminster Fuller, whom she admires.